A century after Escoffier’s and Fannie Farmer’s books codified cuisine, CULINARY ARTISTRY (1996) was a turning point for restoring creativity to chefs as the first book to codify the art of culinary composition and flavor compatibility, which freed readers to compose their own flavors, dishes and cuisines. As the first known reference book of compatible flavors, CULINARY ARTISTRY has informed and influenced the creative efforts of cooks on virtually every continent. It has been cited as the favorite cookbook of countless home cooks and professional chefs — including numerous James Beard Award, “Top Chef” and Bocuse d’Or contestants and winners — as well as dietitians and mixologists. 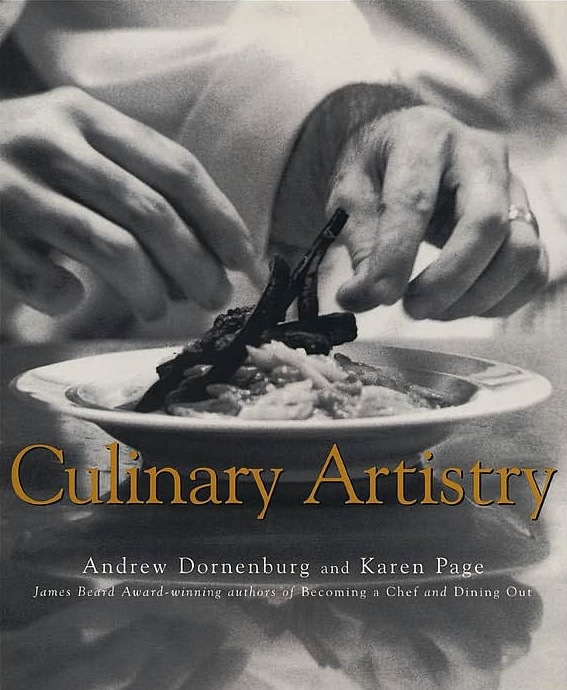 Many chefs and cooks around the world have cited CULINARY ARTISTRY as the single most valuable reference book in their kitchens — in part, for its dozens of pages of listings of flavor matches, which indicate the herbs, spices and other flavorings that best enhance or complement various foods, from apples to zucchini, and from beef to venison. CULINARY ARTISTRY is also the first book to examine the creative process of culinary composition as it explores the intersection of food, imagination and taste. Through interviews with more than 30 of America’s leading chefs — including Rick Bayless, Daniel Boulud, Jeremiah Tower, Jean-Georges Vongerichten and Alice Waters — the authors reveal what defines “culinary artists,” how and where they find their inspiration, and how they translate that vision to the plate. It has largely been the passionate word-of-mouth praise of avid cooks — professionals and amateurs alike — over the past two decades that has continued to interest new readers in CULINARY ARTISTRY to this day. 3) El Bulli by Ferran Adria, and On Food & Cooking by Harold McGee (with two mentions each). “AB: What are your favorite cookbooks? CULINARY ARTISTRY is among the books named (by chefs such as Jeff Keenliside of Fire and Water in Vancouver) in EAT’s survey of British Columbian chefs’ favorite cookbooks. CULINARY ARTISTRY is mentioned as the favorite book of one of America’s Best New Chefs: Will Packwood of Emilia’s in Austin, Texas. “Chef Quinn Hatfield co-owns and manages this eponymous establishment [Hatfield’s in Los Angeles] with his wife Karen. Hatfield’s was one of Bon Appetit magazine’s Best New Restaurants in 2010 and has a Michelin star…Q. What book most influences your food, cookbook or otherwise? A. Andrew Dornenburg and Karen Page’s CULINARY ARTISTRY. “Chef and owner David Katz has made use of his Moroccan Jewish upbringing to build his personal culinaria. One of Esquire magazine’s Best New Restaurants of 2009, Mémé is already a Philadelphia phenom…Q. What book most influences your food, cookbook or otherwise? A. CULINARY ARTISTRY by Andrew Dornenburg and Karen Page. “Harold McGee’s On Food and Cooking: The Science and Lore of the Kitchen is an exhaustive reference on nearly every ingredient imaginable….This book has become my primary food reference, along with the CIA’s The Professional Chef and Andrew Dornenburg and Karen Page’s CULINARY ARTISTRY. For a less intensive and certainly more entertaining food science book check out Robert L. Wolke’s What Einsten Told His Cook. “The intersection between art and food is a dynamic place to be.